It has been an exciting year for design and public policy in Taipei, this year’s World Design Capital (WDC), a designation by the International Council of Societies of Industrial Design that recognizes a city’s “innovative use of design for economic, social and cultural development and to showcase effective design-led revitalization strategies and projects that other cities can benefit from.” Under the banner “Adaptive City – Design in Motion”, WDC Taipei 2016 has connected people with design by making creative products and projects a visible presence in the lives of the city’s denizens. Showing why the World Design Capital title is well-deserved, the year-long program has highlighted the talents of the island nation’s artists and designers with activities like The Square, an exhibition dedicated to innovations in environmental sustainability by young designers; a travel app developed for the CET (Creative Expo Taiwan) Fringe Shop program that interprets city neighborhoods as experiential spaces for creativity and highlights exceptional design and innovation around the city; and YODEX (Young Designers’ Exhibition) in which 9000 students presented 4000 undergraduate design projects. Additionally, WDC Taipei has challenged creative minds with projects such as Design Station, a redesign of Taipei MRT’s public notices and an open call for “carefully researched social design interventions” that revolutionize food production, product consumption, elderly care, and public recreation facilities. 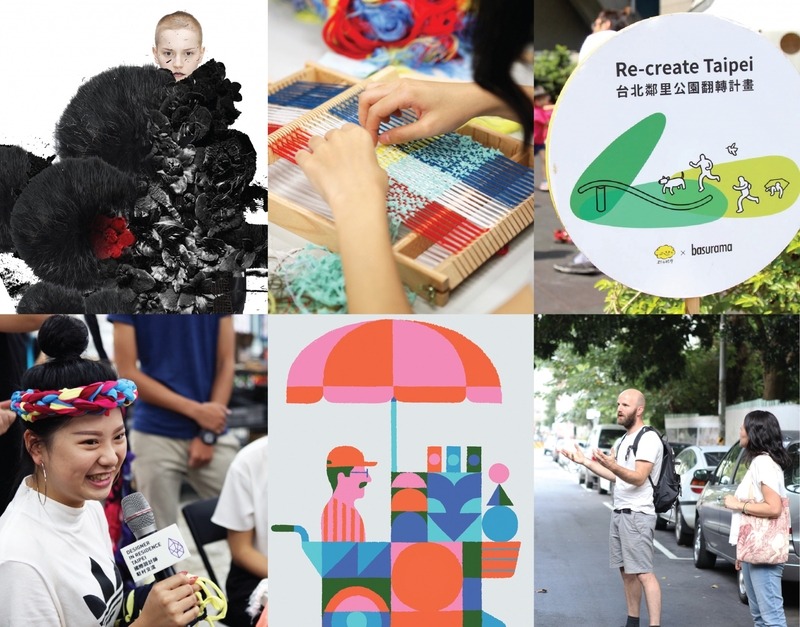 International Design House Exhibition (clockwise from top left): Fashion design by Justin Chou for From Ink to Apparel; Designer in Residence Waste Craft Workshop by Victoria Ledig; Re-Create Taipei by Agua Chou and Basurama for Taipei Issuuuue; Designer in Residence Forest Bathing Workshop by Bennie Meek; Vendor by Adrian Johnson for Visual Taipei; and Designer in Residence Waste CraftWorkshop by Victoria Ledig. First, the International Design House Exhibition (link to Chinese page) explores how global cities can use design to face continuing challenges of urbanization. From October 13 – 30, the public is invited to visit the six pavilions of the exhibition, located in Songshan Cultural and Creative Park. 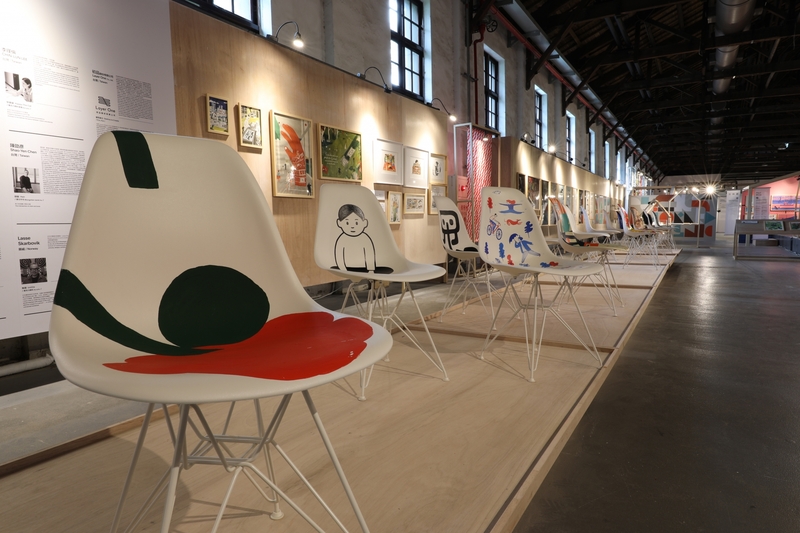 “We hope that the International Design House Exhibition will inspire Taipei citizens and visitors to come together and share their ideas as we open a new era where design thinking and public participation drive future development,” said Hsieh. 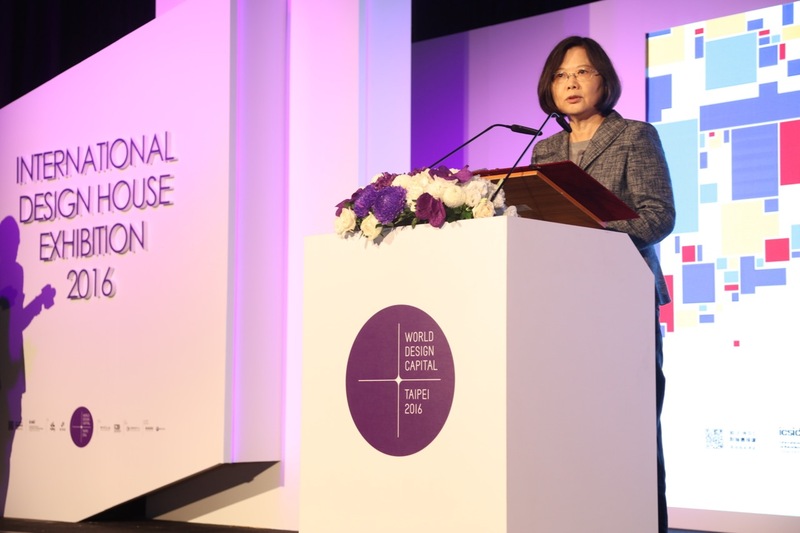 Taiwan President Tsai Ing-Wen on stage at the World Design Capital Taipei 2016 International Design House Exhibition Opening press conference on October 13. At the opening ceremony, six cities signed a Memorandum of Understanding in order to strengthen bilateral exchange and cooperation by enhancing the promotion of design and exploring export opportunities for the design industry. The signatory parties, which included Cape Town, Eindhoven, Helsinki, Kolding, Mexico City, Phoenix, and Taipei, agreed to facilitate collaboration in design exchange, the incubation of talent, industrial support, and research and development. In the International City Pavilion, Unfold Cities, 13 participating international cities, countries and organizations from Austria, Beijing, Cape Town, Germany, Helsinki, India, Mexico, the Netherlands, Osaka, Paris, the Philippines, Switzerland and Yokohama, showcase their design strengths and share projects that illustrate the power of design to solve urban problems. As part of the pavilion, an interactive exhibition from Eindhoven, the Netherlands, invites visitors to design the ideal city, “Taipeindhoven”, using virtual reality software. Designers from Cape Town will showcase the Hasso Plattner Institute of Design Thinking at the University of Cape Town, also known as “D-School.” One of only three design thinking schools in the world, the institute trains university students, industry leaders, and public and private professionals, and is one of the key legacy projects of WDC Cape Town 2014. Taipei Issuuuue, the theme of Taipei Pavilion II, curated by Agua Chou of Taipei-based studio Agua Design, showcases the results of innovative WDC Taipei 2016 projects, including the International Design Open Call and Designer in Residence programs, and explore the impact of public planning and design policies in Taipei City. The exhibition space will also be used for a series of interactive forums and workshops aiming to inspire visitors to consider problems currently faced by Taipei and help them learn how to solve them by applying design thinking methods. Participating companies will include local crowdfunding platform zeczec and bathroom fittings design and manufacturing firm Sheng Tai Brassware Corporation, which also owns the famous brand JUSTIME. 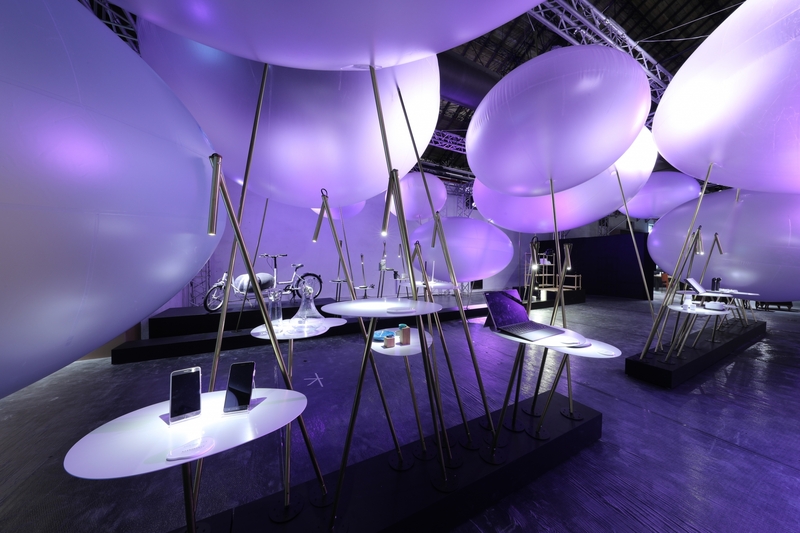 Inside “The Power of Taiwan Design Pavilion” at the World Design Capital Taipei 2016 International Design House Exhibition. In Taipei Pavilion I, Page Tsou, celebrated visual artist and founder of Taipei-based studio Auspicious Design, presents Visual Taipei. This exhibition shows the blurred lines between graphic design, illustration, and art, challenging context-based perceptions of what visual art is and should do. It features over 300 works by renowned illustrators, graphic designers, and visual artists from around the world, including Jim Stoten (UK), Natsko Seki (Japan), Einar Torkowski (Germany), and Julien Pacaud (France). Twenty of these artists have been commissioned to create works reflecting their impressions of Taipei. Tsou says, “It’s interesting to see how these artists create work in their own style to show Taipei. But I think it’s also really difficult for them because Taipei is not like London or Tokyo or New York, which have some very obvious landmarks. We just have Taipei 101 but that could be very boring. It’s really hard to define what Taipei is, and it’s interesting to see how other people see this topic, not just foreigners but also people from different cities in Taiwan.” The exhibition will also feature classic Herman Miller Eames Molded Plastic Chairs printed with the works of 15 artists, and a movie theatre showing animated artworks. Inside the “Taipei Pavilion I” at the World Design Capital Taipei 2016 International Design House Exhibition. Renowned Taiwanese contemporary calligraphic artist Tong Yang-Tze presents From Ink to Apparel: A Crossover between Calligraphy Art and Fashion Design. “We hope to overturn this concept of calligraphy being an ancient art only for the older generation. The younger generation should be able to participate in both its artistic appreciation and creation. This exhibition is a great opportunity to promote the art of Chinese calligraphy,” says exhibit executor Lori Liu. This collaborative exhibition will feature the works of six up-and-coming Taiwanese fashion designers: Apu Jan, Shao-yen Chen (founder of Shao Yen), Yu-ying Chou (Just In Case), Kilin Chen (Homme Van Lab), Pei-chieh Chen (Chiehms), and Shun-min Wang (Fu Yue). Tong is determined to remind people of the artistic expressiveness and cultural significance of handwritten Chinese characters and to breathe new life into traditional calligraphy. 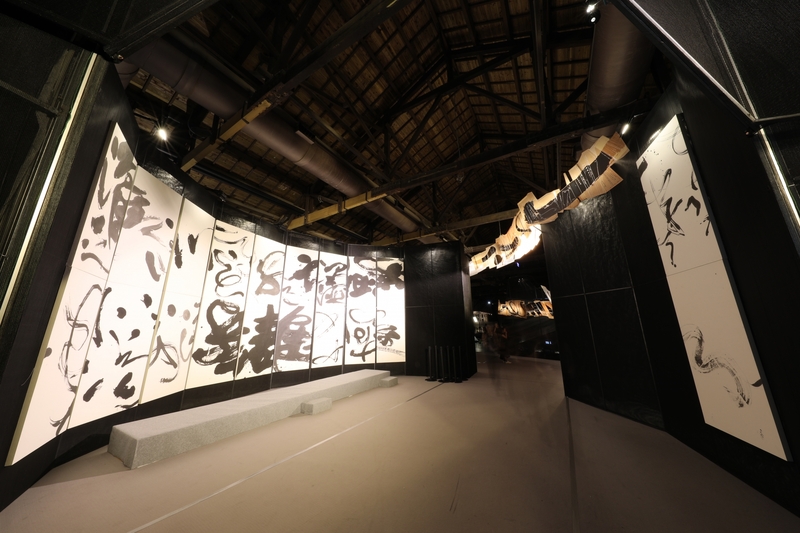 Inside “From Ink to Apparel-A Crossover between Calligraphy Art and Fashion Design” at the World Design Capital Taipei 2016 International Design House Exhibition. On October 15 and 16, the Taipei International Convention Center hosts the first international design policy conference (link to Chinese page) in Asia with 20 top international design-related leaders, professionals, scholars, and policy makers. With sessions titled “Design for Public Policy”, “Design for Social Impact”, “Design for Future Living”, and “Design for Sustainable Cities”, forward-thinking ideas that better people’s lives, individually and as a society, through design and public policy will be explored, laying the groundwork for implementation and change for the public good around the world. Following the conference, on October 17 and 18 at the Taipei Fine Arts Museum, the WDC International Design Week Forum (link to Chinese page) invites established design industry figures for an introspective discussion on the influence of design exhibitions on the design industry and the cultural fabric. Sessions include “World Design Capital”, “Opening Up to the World”, and “Asia Impact”.